When the aortic valve becomes stenotic, it causes a pressure gradient between the left ventricle (LV) and the aorta. The more constricted the valve, the higher the gradient between the LV and the aorta. For instance, with a mild AS, the gradient may be 20 mmHg. This means that, at peak systole, while the LV may generate a pressure of 140 mmHg, the pressure that is transmitted to the aorta will only be 120 mmHg. So, while a blood pressure cuff may measure a normal systolic blood pressure, the actual pressure generated by the LV would be considerably higher. 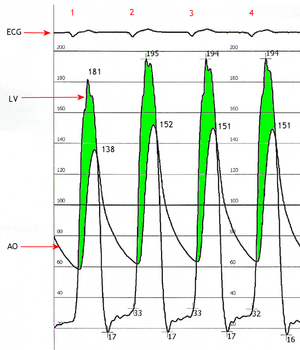 In individuals with AS, the left ventricle (LV) has to generate an increased pressure in order to overcome the increased afterload caused by the stenotic aortic valve and eject blood out of the LV. The more severe the aortic stenosis, the higher the gradient is between the left ventricular systolic pressures and the aortic systolic pressures. Due to the increased pressures generated by the left ventricle, the myocardium (muscle) of the LV undergoes hypertrophy (increase in muscle mass). This is seen as thickening of the walls of the LV. The type of hypertrophy most commonly seen in AS is concentric hypertrophy, meaning that all the walls of the LV are (approximately) equally thickened. Causes of aortic stenosis include acute rheumatic fever, bicuspid aortic valve and congenital anomalies. As individuals age, calcification of the aortic valves may occur and result in stenosis. When aortic valve stenosis occurs, the aortic valve, located between the aorta and left ventricle of the heart, is narrower than normal size. Current medicine has displayed a trend toward less interfering techniques but more invasive surgical approaches in older patients with more comorbidities. PURPOSE: Aortic valve calcification (AVC) measured by multislice computed tomography (MSCT) has previously been shown to be of prognostic importance.